The value of a complete, healthy smile is beyond measure. Your teeth serve so many purposes. Obviously, they play a functional role in chewing and speech. Teeth are important for healthy jawbone mass, and they provide structure for the face. Your smile is one of the first things others notice about you and can be a tremendous source of confidence. A smile with missing teeth robs you of these advantages. Residents of Raleigh NC who want vibrant, healthy smiles depend on the restorative dentistry services of Dr. Robert Allen and the team at Raleigh Dental Excellence. Dr. Allen restores dental implants to help patients with missing teeth regain their smile and revitalize their quality of life. A dental implant imitates the structure and function of a natural tooth as possible. An implant has three parts, with each part playing a specific role. The implant post or screw, which is made of biocompatible titanium, is placed in the jawbone to replicate a tooth root. A small fastener, called an abutment, sits atop the post. Then, an implant crown or is fastened to the abutment to complete the restoration of the missing tooth. 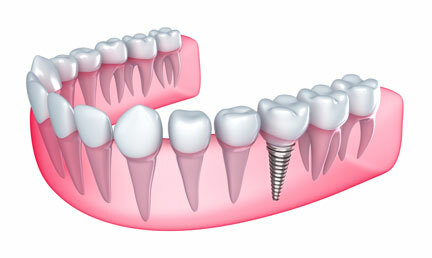 Because the implant replaces both the root and crown of a tooth, it makes the body think a real tooth is in its place. Chewing forces travel down the post to stimulate bone tissue and eliminate the atrophy that occurs when this stimulation is missing. No other replacement tooth option provides this benefit. Dental implants let you eat what you want and fully enjoy the flavor of foods. After a surgeon performs the surgery to place the implant post in your jaw, Dr. Allen will restore your missing tooth with a dental implant. He can also custom-craft a denture or bridge to attach to implants. Multiple replacement teeth supported with implants can be removable or fixed in place, depending on your needs and desires. Contact Raleigh Dental Excellence to schedule a dental implant consultation with Dr. Allen.